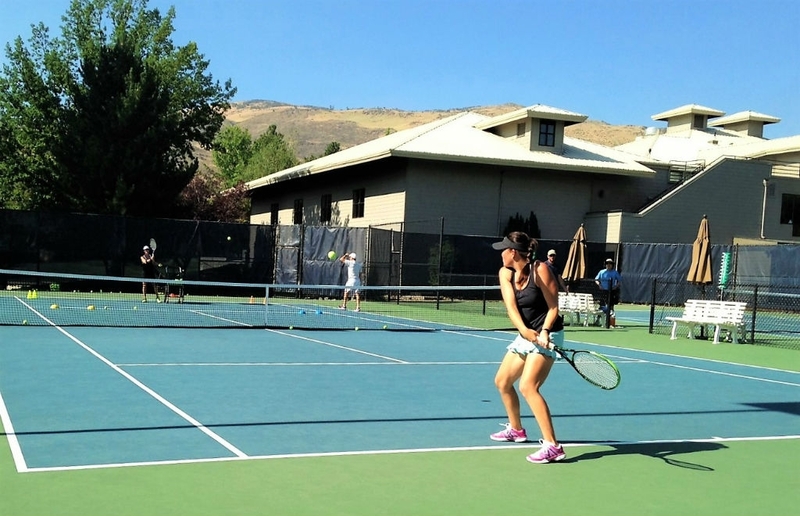 Receive the best Reno tennis lessons and tennis instruction from our tennis pros. Tennis lessons are offered to kids, beginners, and adults of all ages and abilities out of Caughlin Athletic Club. Go play tennis the SMART way! Our tennis instructors and pros believe in focusing on the fundamentals of tennis and creating a fun environment to learn how to play tennis. 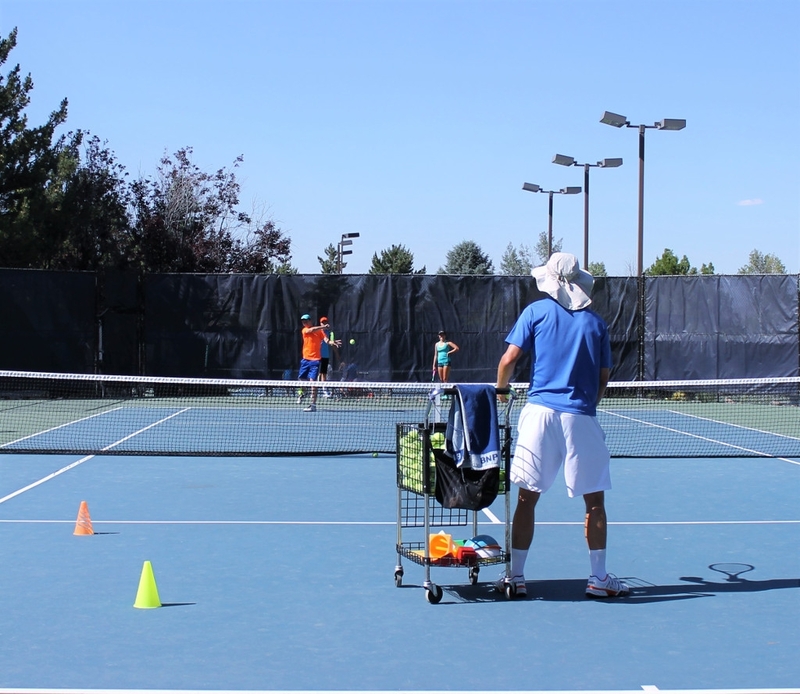 Tennis lessons and classes are offered to the public at Caughlin Athletic Club. All youth tennis classes for kids have one critical focus: to ensure a happy and positive tennis experience for every child. Tennis lessons and instruction incorporates tennis games for kids, along with tennis drills for kids that will emphasize “Fun” when playing tennis. All tennis lessons for beginners are kept at maximum of 6:1 student to instructor ratio to ensure a high quality of tennis instruction. All tennis lessons commence with a 5 minute dynamic warm-up and stretch followed by a technical overview of stroke mechanics that will be covered during the class. Rapidly paced tennis drills follow, that target the specific tennis lesson for the day. Individualized feedback for each student is provided immediately on the spot to help each student realize their tennis technical potential. Live-ball cooperative drills begin half way through the tennis lesson. The tennis instructor is highly involved in the live-ball drills. Customized competitive games for the class close out the lesson. Tennis Nation believes that each tennis player should have a vision for how they see themselves playing tennis in the future. This future vision should be based on a strong technical foundation. Our tennis lessons are based on the fundamentals of tennis: efficient stroke mechanics, footwork, balance, posture, rhythm, momentum and positioning. Tennis instruction is specific and detailed for each student. Our tennis pros communicate effectively and utilize tennis progressions so that the lesson can be digested and implemented into the student’s game. Modern video technology is utilized in tennis lessons to analyze a student’s game and pinpoint areas of focus by providing specific feedback and recommendations for improvement. Once the student is reaches a level where rallying is possible, the tennis classes shift focus. Emphasis is put on how to structure tennis points and utilize psychology to figure out opponents and overcome obstacles on the tennis court. Tennis as a sport is very detail oriented however at Tennis Nation Racquet Sports we believe tennis players must enjoy themselves on the court to improve at tennis. After all tennis is a game. When enjoying the game students tend to focus on the ball and release tension which allows for strokes and movements to flow on the court. As tennis instructors it is rewarding seeing our students enter a zone where tennis becomes effortless and the desire for the game grows. Tennis Nation Racquet Sports is where to play tennis. Reserve a class today!